It happens quite fast and dream like. I never forget the day I walk down the church isle... and I was so nervous, I feel everyones eyes are staring at me. My parents presence comforts me. And when I got a glimpse of Julian from afar, looking rather nervous and handsome... Everything else seems a blurr. The memorable part of our wedding was the exchange of our marraige vows. Julian squeezes my hand and expresses his love and devotion. I never heard so much love in his voice. I love you so much hun! My ever charming friend, actress Melissa Mendez graces her presence with us. It was the best day of my life and I am thankful to everyone who came and made the whole thing possible and memorable for me and Julian. I love you guys! Although, the boxing event of Pacqiao and Hatton didn't dampen Julians bearing, When Hatton got floored out. =D We also celebrated Manny's winning bout. I will post photos and videos very soon. I will have all the copies in 6 weeks time according to my photographer and videographer. Keep tuning in! The Family Planning seminar was conducted the next day after we filed our marraige license in the Mayor's office. We were late, coz we got waylaid by heavy traffic. Good thing, we were able to get a seat. The person who gave us a lecture, was kind enough to speak in taglish ( English Tagalog combined language ). It was so funny, as Juju keeps nodding his head, like he understands her very well. And after awhile, he gives up, and gave me a puzzled and helpless look. Like, what is happening here? When Everyone are laughing at the lecturers attempt of jest. I have to explained with him or he will keep bothering me with questions. It went well and I quite enjoyed the lessons about the importance of marraige and family planning. We woke up early at around 5am. We need to be in the embassy to get the CNI as early as possible. We got there at exactly 7:40 am. Our good driver knows his way around Taguig. Thank you Rudy! We went inside the embassy premises. The place is newly built and its made out of billet of steel. Very modern in Architecture design. I couldn't help, but notices the heavy security, guarding the vicinity though. From the steel gate, we were escorted with an armed security guard to the consular office. It didn't take us very long to wait. At exactly, 8am, We were both interviewed. We hand them the requirements, and paid the CNI fee. CNI fee apparently went up from £59 to £63. The British currency exchanges as of 09 April 2009 from£1 = Php72. We were told to wait for an hour. But we got the certificate in just about half an hour only. We were pleased to have it early. Kudos to the British Embassy! We had our breakfast in Chowking Baclaran. Then, We went straight to Bacoor Municipality Office. We met Tita Nenen, Who was kind enough to assists us. We finish in just barely an hour. We were told to come back the next day for 'family planning' seminar. Then that's it! We will get our marraige license in April 30th 2009. "He is in heat shock." I know Julian tried to reassures me that he will get used to the weather in a day or two. But I doubt it! His first day was great. Although we didn't accomplish anything at all with our plans. We were hoping to catch the priest with his busy schedules. But we weren't lucky enough. We just spoke briefly with his secretary in his office and requested for another time for a meeting. And our meeting with the wedding florist was also postponed as she was not feeling at all well. We went to Mcdonald right after and had our lunch. And we went straight to SM Molino to buy some of the things he needed. We went also to Pizza Hut for some pizza snacks. We came home tired. My mum cooked us a delicious patatin for our dinner. His ETA ( Estimated Time Arrival ) from Hongkong to Manila has been moved from 18:35 to 19:00. But the plane arrived exactly at around 19:15. Zyke keep asking if his Daddy Juju has stopped flying? The boy was in euphoric mood. He couldn't contain himself and brag with his new found friends in the airports waiting area, that his english daddy is finally coming home. He has to wear his daddy's gifts last year, his england football uniforms. And told his friends, where he got them from. He started to talk in english, and asked everyone if they speak good english like he does. I spotted Julian just in time, outside, wearing a white jersey england football top. And I couldn't contain my smiles. It's good to see him again! The day has ended with welcome greetings and warm smiles from friends and family. Tea is an english customs which was serve daily in the afternoon as their light meal. Traditionally, english tea would be served in a teapot with milk and sugar. Since Julian is an english by ancestry, We will be giving away a limited teacup along with teabags as souveniers for our selective guest. However, we are going to have a compilation of selective songs that will be played in our wedding day. We will be making a copy and giving it to our special guest as souveniers. Chocolate cakes are definitely on my list. Although, sweet and expensive as it may taste like, but I was able to get a good deal from a lady who makes delicious cakes and with reasonable price. The tibetan Buddhist believes in 5 sacred stones: the crystal for light, turquoise for infinity of sea and sky, coral for life and form, gold for the golden ray of the sun, silver for the light of the moon. It is intimately linked with Divinity and those gods associated with the Sun. And It symbolizes wealth and success. It is no surprise that gold symbolizes wealth used wisely, but it is also the symbol of good health. Isn't it that great? People who favor the colour gold are optimistic. I will be likely using a metallic Gold as our wedding motiff, as it defines luxury and elegance also. WHITE ROSES FOR MY BOUQUET. There is something about white roses that I love Besides its soft creamy petals, White Roses represent innocence and purity and are traditionally associated with marriages and new beginnings. It is also a symbol of honour and reverence. I have requested 3 doz. 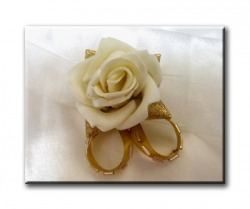 of White Roses with a golden pearl accent for my bouquet. I can't wait to see it. And a Red Roses for my Maid Of Honour and Brides Maids. I love the combination of Gold and Red. Although common to many. But Roses makes a great symbol for a bride to be. There is a reason that roses are the most popular choice of flowers for brides. A white rose stands for innocence, beauty and charm--just the traits every bride wants to portray. A bride that chooses red roses for her wedding flowers is sending a message of passion and of fiery love. If dark pink roses are used for a wedding, the couple is expressing a thankfulness that they found each other. An ivy colored rose stands for fidelity in the marriage--something every new couple strives for. If you are having a spring wedding, there is simply no better way to express your love for your future spouse than by carrying a bouquet of tulips. They are not only beautiful, but speak of an undying love. Daisies are many people's favorite flower, but not a lot of brides use them in their wedding decor. They might if they understood their significance! Daisies stand for romance and an innocent spirit. Does that describe you? These graceful flowers are reminders of our past generations when grace and beauty were the rule. Associated with elegance and charm, a calla lily would be the perfect flower if you wanted to create a sophisticated atmosphere for your wedding. I made a new friend today when I met the owner of the flower shop I have commissioned to make my bouquet, bouttoniers, and wrist corsage for my wedding next month. My friend Sally, who managed the shop has gracefully introduced us. Malou in her mid 30s, is also married to a british guy. She is cheerful and amazingly friendly. We exchanged quite a few story, and despite the lack of time, we still manage to enjoy our chitchat. 3doz White Roses for Bridal Bouquet. 1 Bouttoniere for Best Man. 2 Bouquet for Bride's Maids. 1 Bouttoniere for Groom's Man. 1 Bouttoniere for Bible Bearer. 1 Bouttoniere for Coin Bearer. 1 Bouttoniere for Ring Bearer. 1 Wrist Corsage for Mother. 4 Bouttoniere for Male Principal Sponsors. 4 Wrist Corsage for Female Principal Sponsors. 3 Bouttoniere for Male Secondary Sponsors. 3 Wrist Corsage for Female Secondary Sponsors. 4 Flowergirls Headress and Baskets adorned with flowers. Early this morning, after I had my coffee, I called Tita Nenen to check with her the wedding date that Fr. Irelli suggested prior to the 10days posting as required by the Philippines law. Tita Nenen, reassured me with her usual cheerful voice. I have had vague memory of her, It was over a year ago since Julian and I had our visits to the office of the local municipality. We were with Tita Wanda, who was kind to assists us, also works in the Mayor's office. She introduced us with Tita Nenen. We were given a list of requirements to serve as a guide in applying for a Marraige License. So, the date is set to May 3rd. Although the Church and the Municipality Officers in Charge has agreed to the specified date, it is not an official date as of yet, until Julian and I will be given a definite schedule of the marraige license release date. I prayed that there wouldn't be any more hindrances. Marriage License is a requirement for either a Civil or Church wedding to be held in the Philippines. The Application Form for a marriage license must be secured at the Local Civil Registrar from the city, town or municipality where either the bride or the groom habitually resides. The personal appearance of those getting married is required in applying for a marriage license. Each of the contracting parties shall file separately a sworn application for each license with the proper local civil registrar. Philippine law prescribes a ten-day waiting period from the filing of the Application to the issuance of the marriage license. The license is valid for 120 days from date of issuance and may be used anywhere in the Philippines. 1. Birth Certificate: Certified True Copy required that is issued by the National Statistics Office (NSO). I was able to get my Birth Certificate in NSO on the same day I have them requested. Good thing about the regional branches. I got mine in Muntinlupa City. NSO branch. It was just about 40mins drive from home. We waited for about an hour or so. I went to the office early with my mate, Bing. I requested 3 copies and it cost about 190php/ page. 2. A Certificate of No Marraige ( CENOMAR ) that is issued by the Office of Civil Registrar General or NSO. I also requested a copy of my cenomar, the same day i requested my birth certificate. I was scheduled to return after 2 weeks, and i requested 2 copies and paid about 240php/ copy. A certificate of Legal Capacity to Contract Marriage for foreign nationals is required. This will be requested and issued by the UK embassy, prior to the issuance of a marriage license in the Philippines. This serves as a clearance or permit from the consul as an actual proof of the subject’s civil status and eligibility for marriage. 3. And a Xerox Copy of Passport, first page upon your arrival in the country. And a 2x2 ID picture for both with a 300php fee for the marraige license. That's it! I haven't been able to do much more than just plan and daydreaming. Although I tried to shake this habit to keep me from getting overwhelmed and well, nervous. I will keep you guys updated tomorrow on my wedding preferences. Julian and I has been planning our wedding years ago. I never thought about it that much until last month, when Julian booked a ticket for his next visit in April. We both want to the tie the knot. Seriously. Nonetheless, I am excited for the forthcoming wedding. I didn't dream of having my marraige vows elsewhere but Church. After all these years, God has truly answered my prayers. I haven't known what happiness means 'til the day i will walk down the aisle and be with the man i have love so much, as God will be our witness. Now, I know why patience has it's virtue. Our journey of love is a testament that true love do exist. I made this website and blog to keep my family and friends updated of our wedding in May of this year. Weebly is one easy to make. Although this idea came out a bit late. But nonetheless, this would serve as our diary as we thread our lives and vows to matrimony. And one day, I could look back and cherish these moments again and again. YOUR LOVE, SUPPORT AND GIFTS. We wanted to give our heart felt thank you's to all of you who have been there for us, and help us throughout our wedding preparations. Julian and I appreciated all the gifts, wishes and support from our dear family and friends.